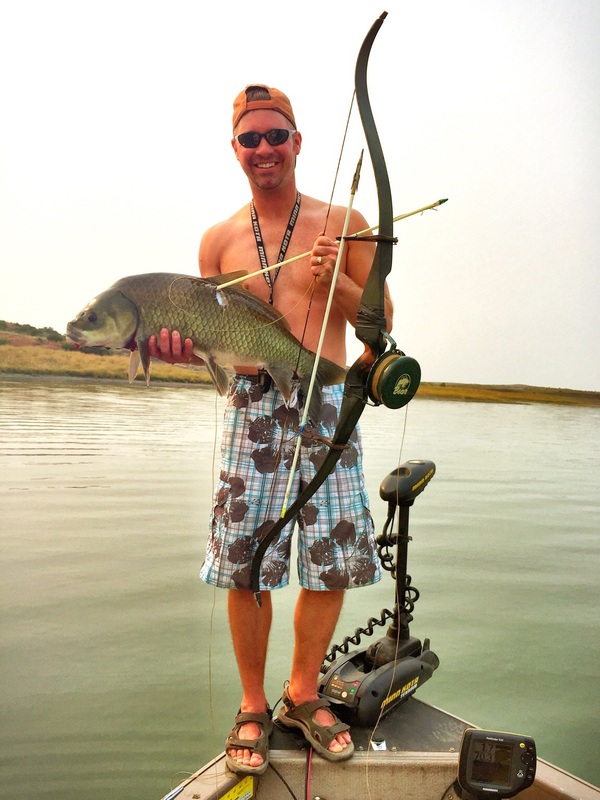 Bowfishing is an Awesome Summer Archery Sport! Some Proud Girls! They did an awesome job paddling the canoe into some carp! 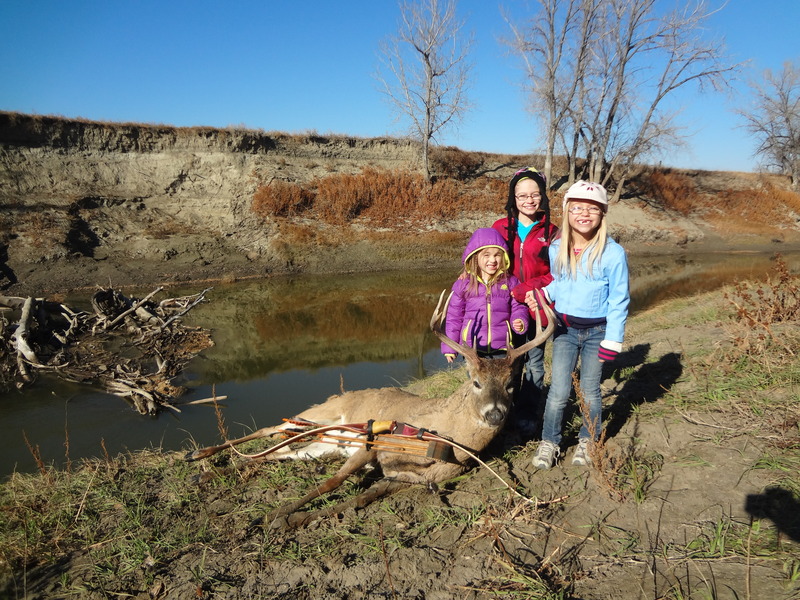 Archery provides great family fun! 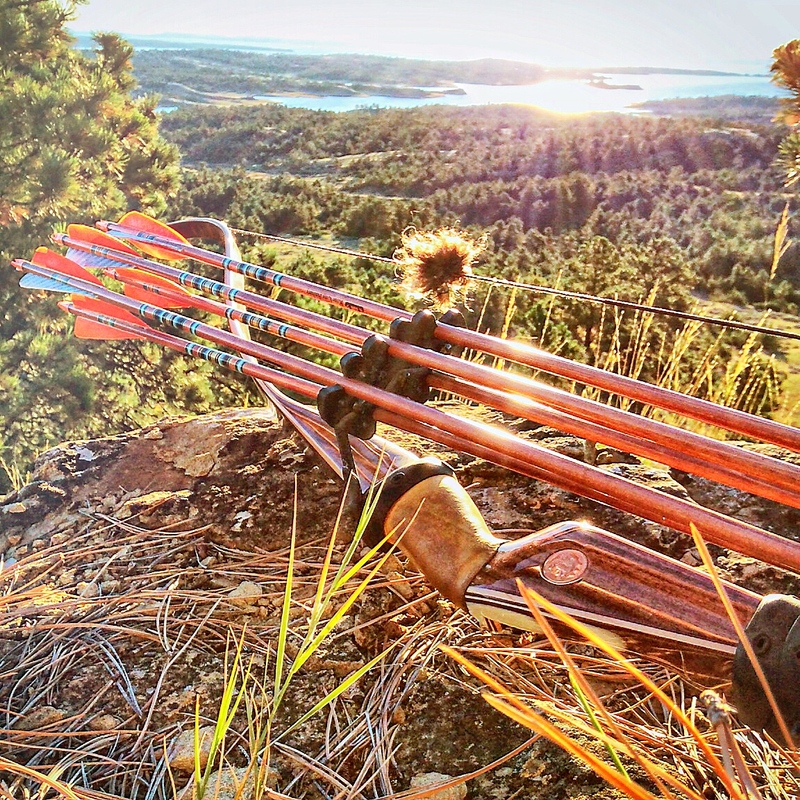 What do archery and bowhunting enthusiasts do in the summer months? 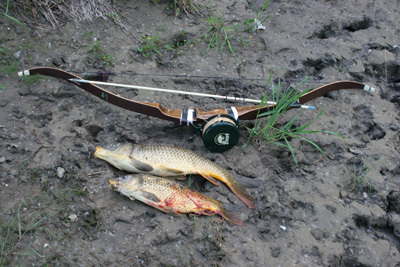 Well…there’s different kinds of target shooting like 3D shooting, paper targets, stump shooting, roving…and BOWFISHING! 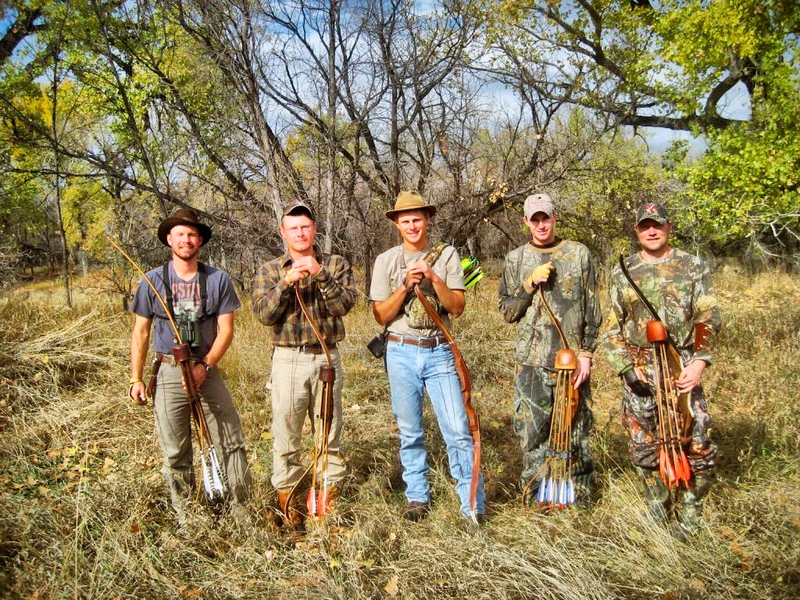 Many of you have experienced how much fun it is to bowfish, but sadly so many people have not. There are many different types of water dwellers to bowfish for across the world…a simple search on the internet can open a world of possibilities and adventures for you. Some of these creatures are just magnificent! 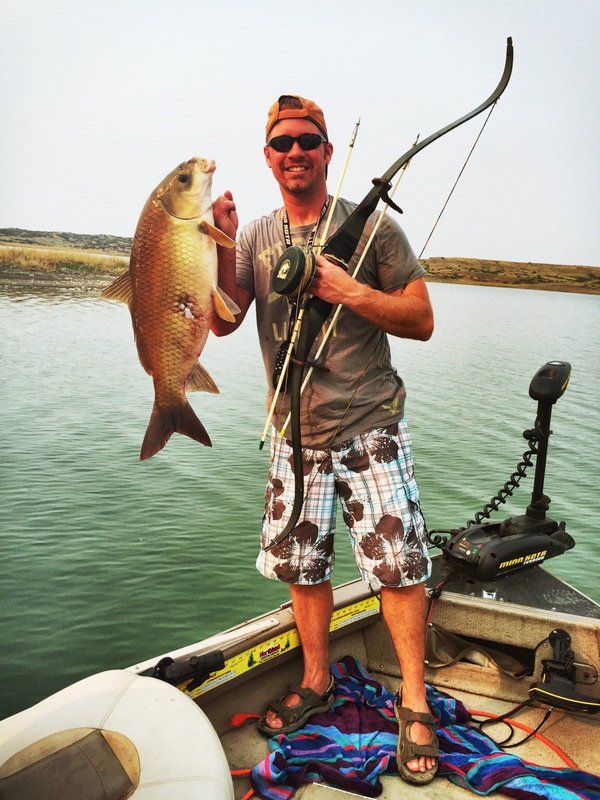 Up where I live, in Northeastern Montana, bowfishing addicts can usually be seen on the lake and rivers bowhunting carp in the summer months. 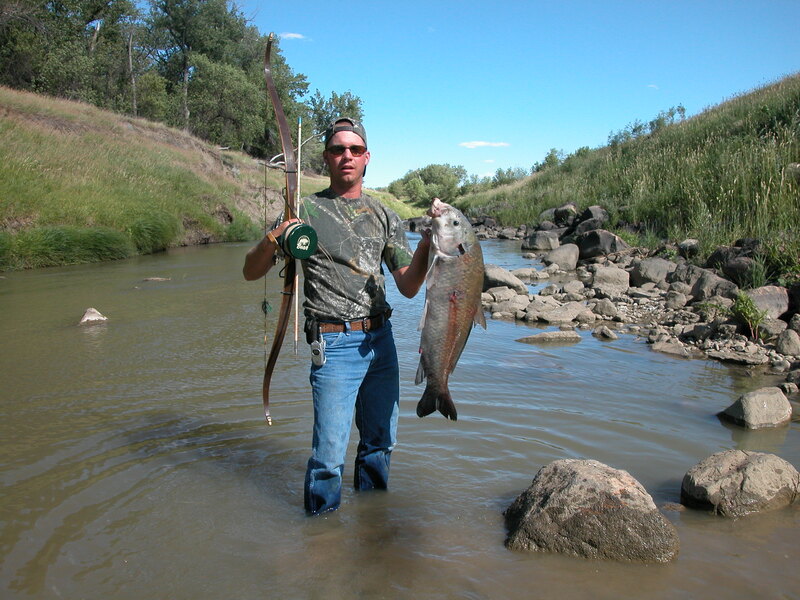 Paddlefish bowfishing is an addiction all its own and is popular here as well. But where you can only harvest one Paddlefish (and it’s worth it…from 15lbs to whoppers around 50lbs! ), your common carp take is unlimited. 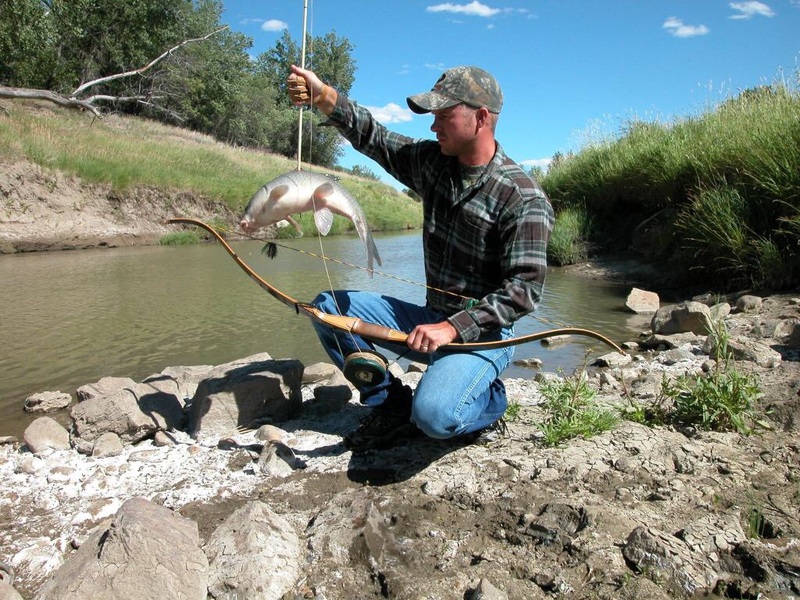 In Montana, there are entire tournaments dedicated to bowfishing carp and it is used as a means to control the carp population in many lakes. 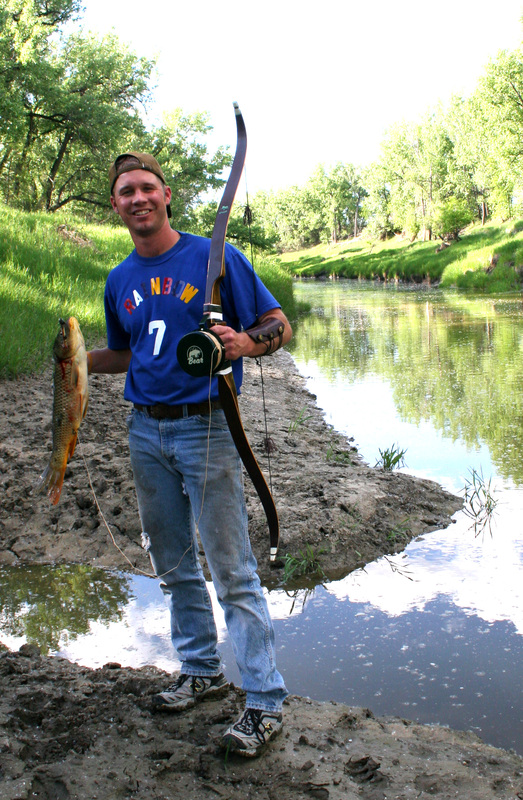 Well, if you haven’t bow-fished before and your interested, it’s easy to get into the sport. It can be quite affordable to get into or as expensive as you want to go. 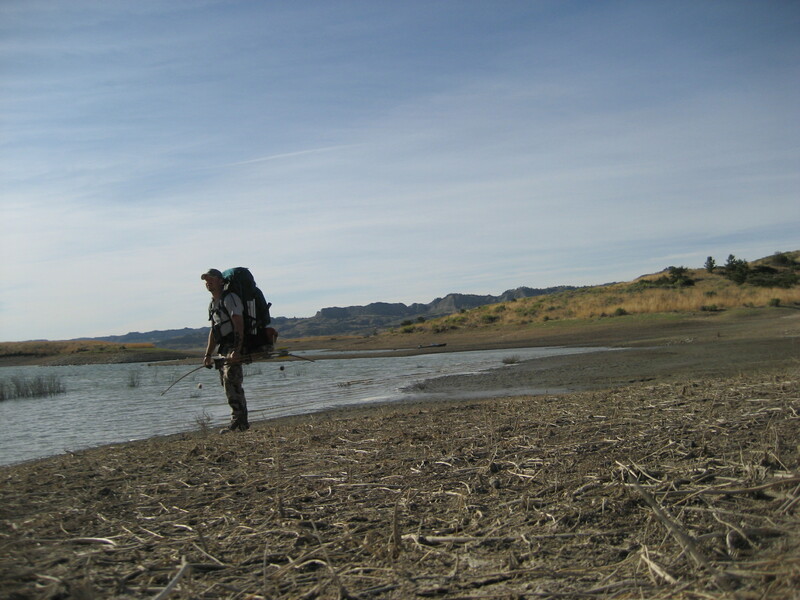 Walking the riverbank for common river carp. an online auction site. Same goes for my old-school manual Bear Archery bowfishing reels, and arrows. There are amazing, modern bowfishing reels that attach to all kinds of bows on the market today and they are the most popular as they reel in your line like a fishing pole, but I guess I just like the nostalgia and simplicity of my old reels (or spools, really…with them your arm does all the reeling!) I used to bowfish with a 60lb Bear Grizzly, but I save that for my dreams of huge Gar in TX as it is simply too much weight for bowfishing carp. 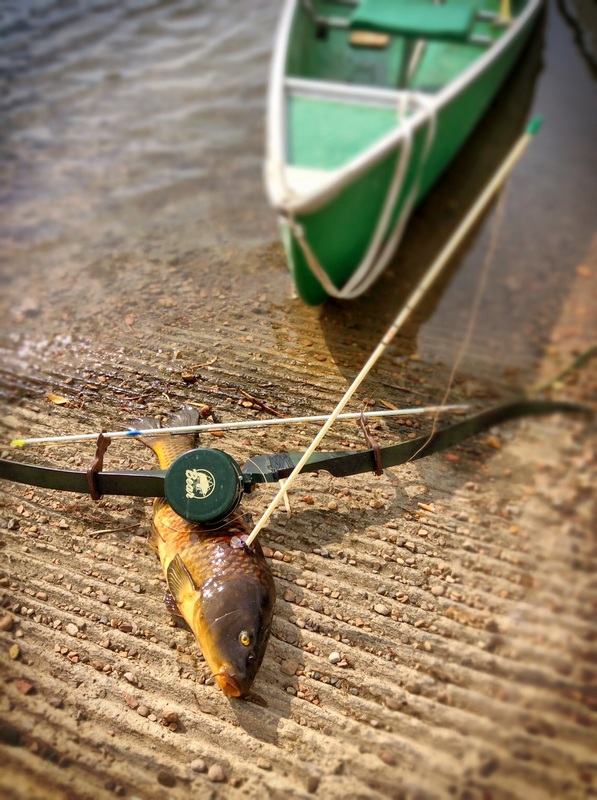 With a heavy bow like that, you arrow usually blasts right through the carp and makes it difficult to get the tip of the arrow to release the fish from your arrow. This was a 19 pound river carp! 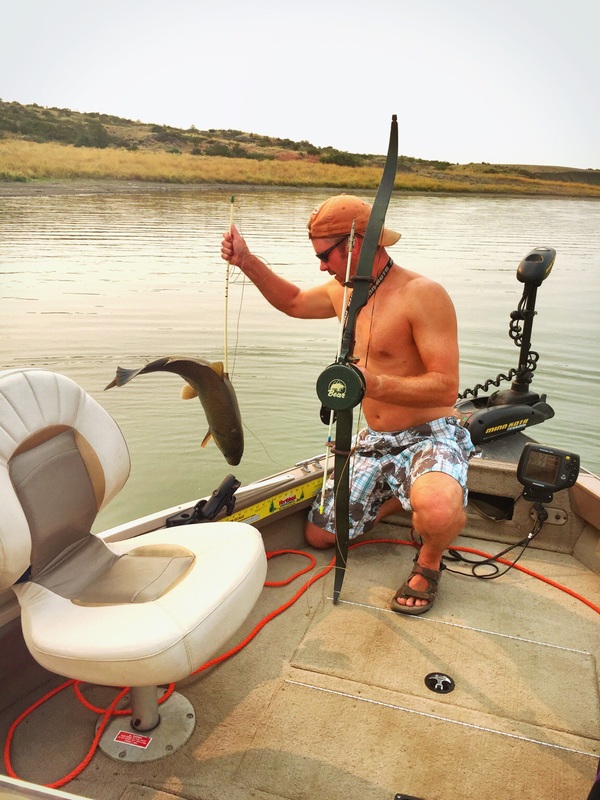 My favorite bowfishing bow is a 45-50lb recurve bow and is plenty of bow, while many people, including my family, bowfish with 25-35lb traditional type bows such as recurves and longbows. 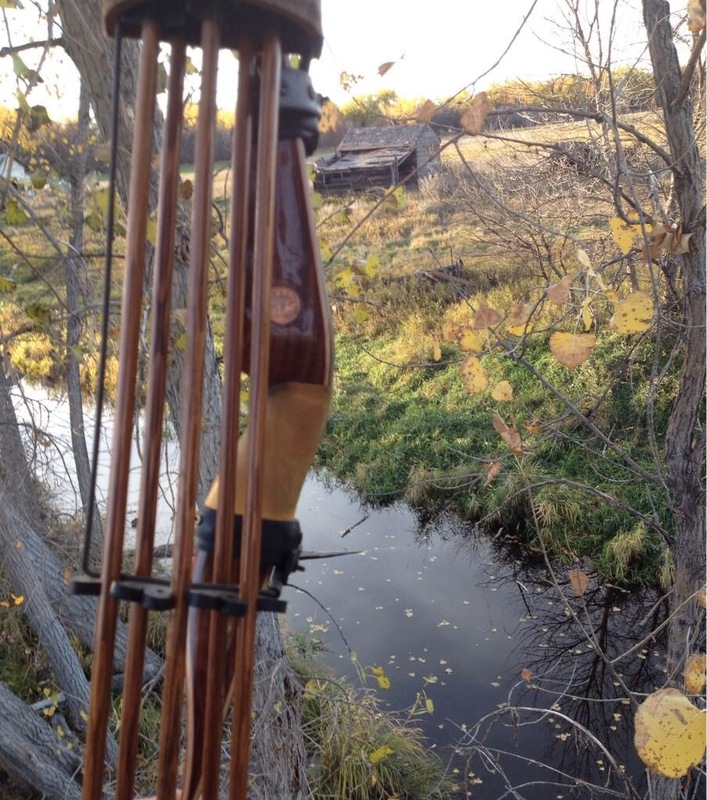 Most people use older recurves and compound bows…this is simply because your bow can get beat up a bit, muddy, scratched, etc…and they are generally much cheaper…these become dedicated bowfishing bows and that way you don’t have to worry about re-tuning or marring up your favorite hunting bow. My girls would help spot the carp…then we would slip in for a shot. 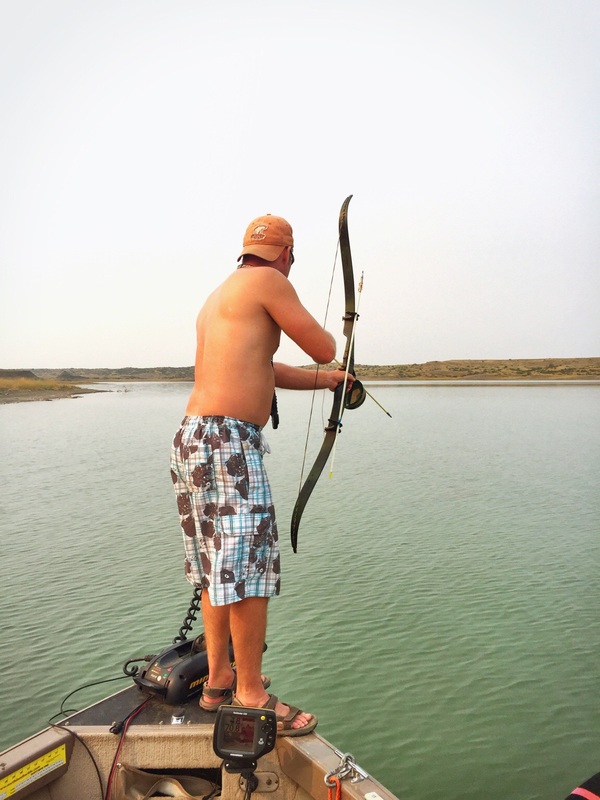 Bowfishing the lake from a boat. 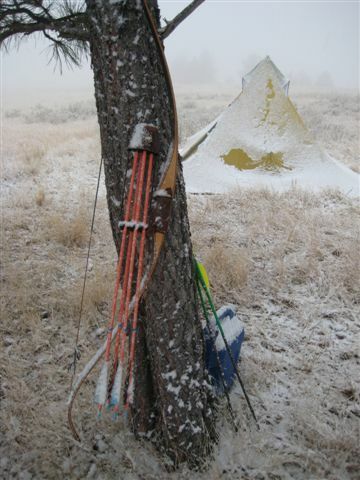 Bear Archery Magnum Recurve. So get after it and expect to have a blast! 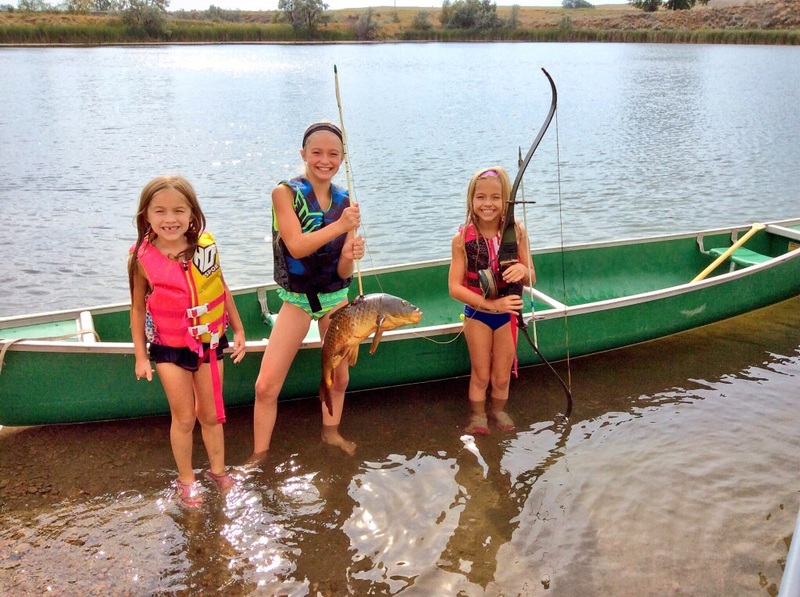 Here are some photos from the last several years of bowfishing in MT…the most fun I have had has always been while my kids were participating…and they love it! You need to have your bow up and ready before you get within bow range for those carp just floating on top of the water…otherwise they may spook! We got this one on video…he put up a heck of a fight in 2′ of water! 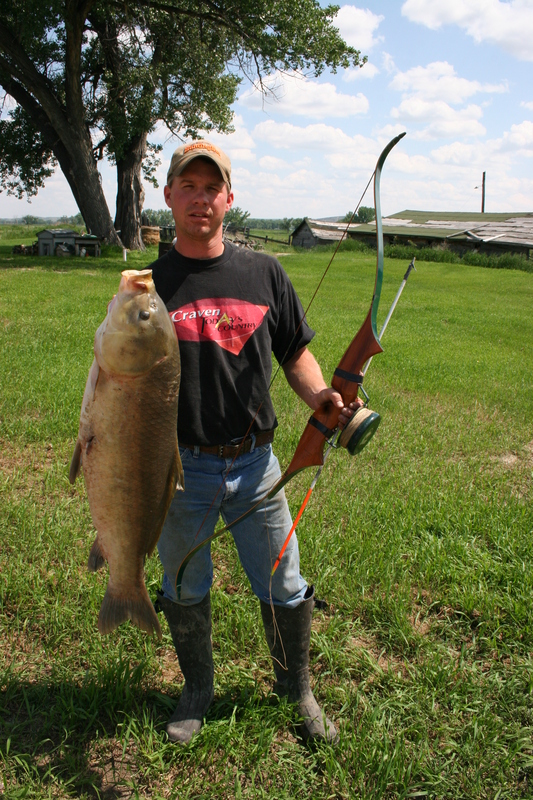 Here’s a river Buffalo Carp…shore bowfishing! This is me trying to duplicate Mr. Bear’s ad…it’s a bit off, but vintage 1957 Bear Archery Kodiak, Bear Archery reel and arrow!! 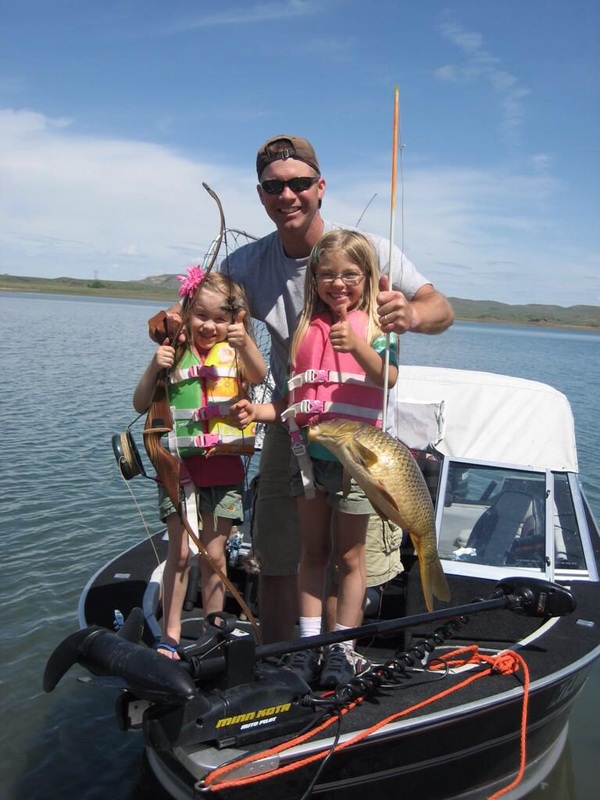 This entry was posted in Bear Archery, Luke Strommen, Traditional Archery, Traditional Archery Hunting, Traditional Bow Hunting and tagged bowfish, bowfishing, carp, paddle fish, paddlefish on April 9, 2016 by rosecityarchery. Have you ever seen the old Fred Bear photos and noticed a leafy branch or somehthing similar sticking out of his hatband? I think I read somewhere that his Dad told him to always take time and see what’s around you, take in nature and never get in so much of a hurry that you forget to look and appreciate what is around you…so Fred would pick a flower, a plant…pick up a feather…study it and put it in his hat as this reminder. It was something along those lines, anyhow. I know that times have changed since those days, but in all reality this concept may not be any more important than it is today. I’m not typing this to preach, scold, or step on a soapbox. 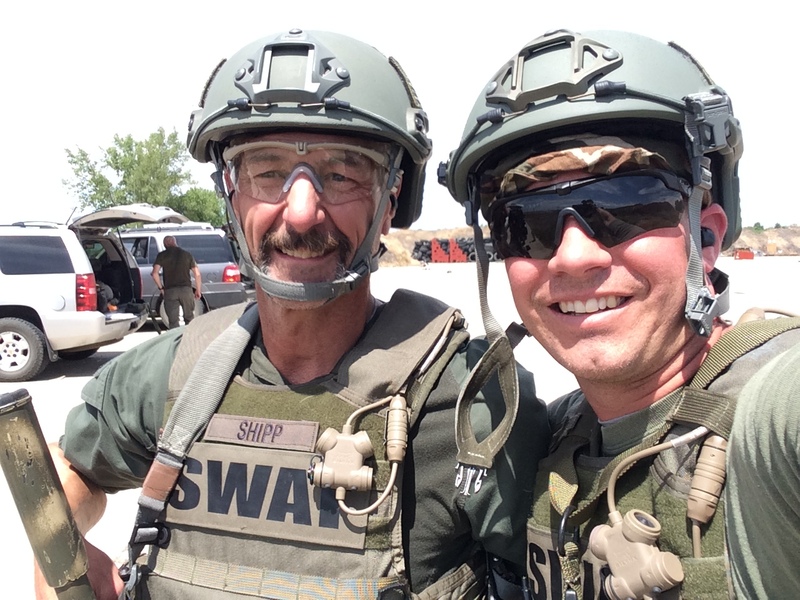 This is kinda an off-the-wall blog perhaps, but it came to me yesterday. Late yesterday. 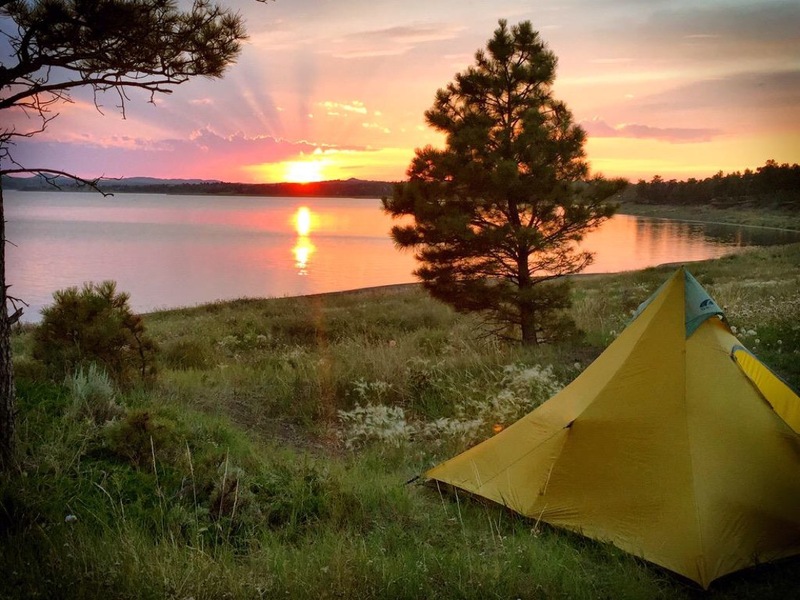 I had hiked to the spine of the timbered ridge because I was tired and I knew there was a road leading back to my pickup. Much easier to walk on a dirt road then pushing through pine, juniper, and other brush while trying not to be tripped up in the darkness. My feet were tired and they hurt. My attitude sucked. I hadn’t seen an elk all day and it was obvious that the rut hadn’t really kicked in yet or at least had slowed dramatically because of the abnormal heat. I tried pretty darn hard and followed the fundementals and even stepped outside the box, but to no avail. The night was now silent and the fickle wind that had tormented me all day was now absent. 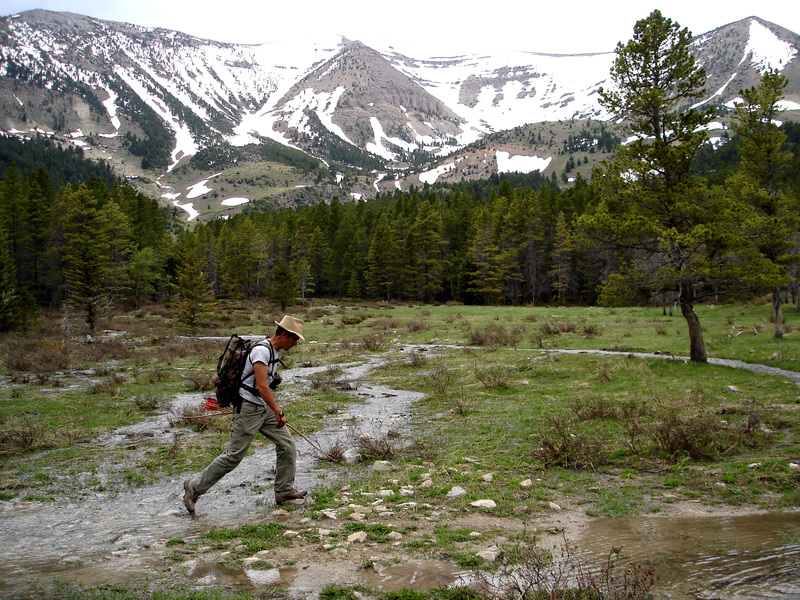 It was just me, the perceived silence, and my footsteps plodding on the dirt. A coyote howled and was followed by a volley of young dogs. I knew I would probably hear over a dozen other males before I got back to the pickup. As I walked, an enormous, full, brilliantly bright moon climbed in the sky at my back, casting my shadow on the road in front of me. I carry my recurve over my shoulder while grasping it’s limb on long hikes, and the outline looked pretty cool. I chuckled to myself and was instantly humbled. I remembered that just a few days ago, I was taking a similar walk on a game trail back to my pickup when the same moon, at that time the “Supermoon”, rose at my back. 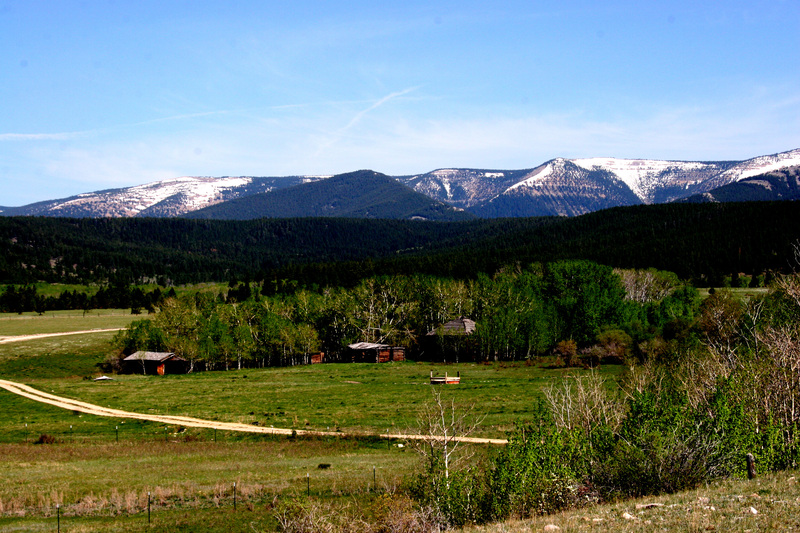 Just a couple hours before, I had called in 4 bull elk…all at the same time and in from 3 directions. 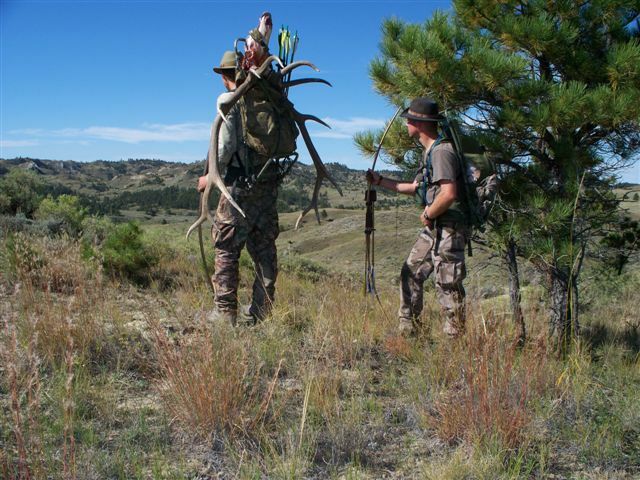 You would think that having 4 bulls come in under 40 yards, with three of them at 25 yards, a bowhunter would be cleaning a carcass. But nope, not me. Not the world’s worst bowhunter. Not the guy that consistently gets close to good bulls but can never close the deal. This was all going through my head then, at that moment when the Supermoon cast my shadow in front of me. Seeing such a “vivid” shadow of oneself while alone in the wilderness causes a wandering mind to ponder all kinds of things. I stopped, turned around, and looked at that amazing moon and all it’s greatness. I pulled out my Vortex binocs and peered at it for some time, in awe. “What a perfect night” I thought. I remember thinking of Wayne and missing my family, so entirely wishing that I could set them here and let them feel what I was feeling and see what I was seeing. I was reminded why I bowhunt. I know I don’t ever forget, but sometimes I think I forget to think about it…does that make sense? So here I was now in the present, on an entirely different ridge, walking back to my pickup. I looked at the same moon again and thought about my hunting day. I had seen many dens today. I had a first experience…I came upon a spot of timber that was choked full of Robins…yes, Robins! There were hundreds and hundreds of them fluttering around the pine trees and spouting off- all within an area smaller than a football field. Then I walked out of them and never saw another one. Crazy. 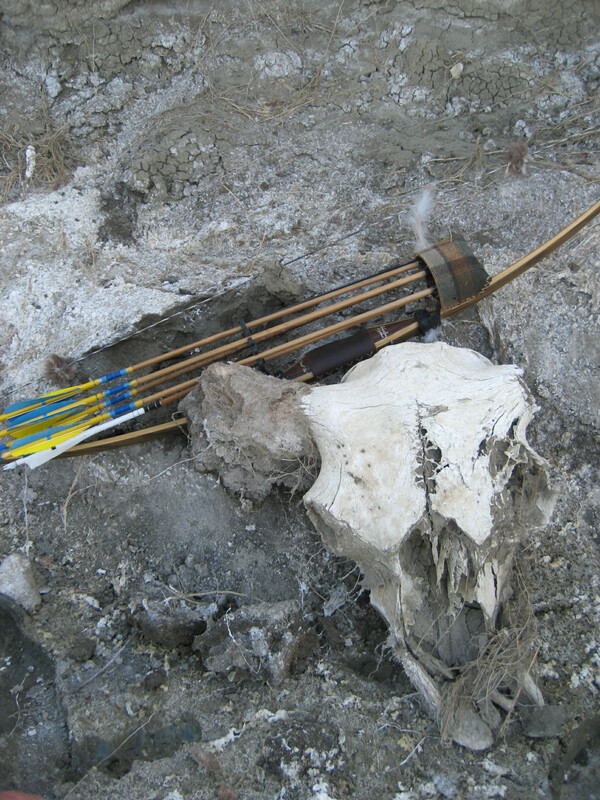 I found a hunters arrow resting on a well-used game trail. The broadhead was marred, but I suspected it was marred from the trees it rested among as there wasn’t any matter on the arrow. I discovered a full waterbottle on it’s side with a pair of prescription glasses next to it. I don’t like being reminded that I’m not the only human that has hunted this timber, but now I thought about it differently and ate some humble pie with a quirky smile on my face. 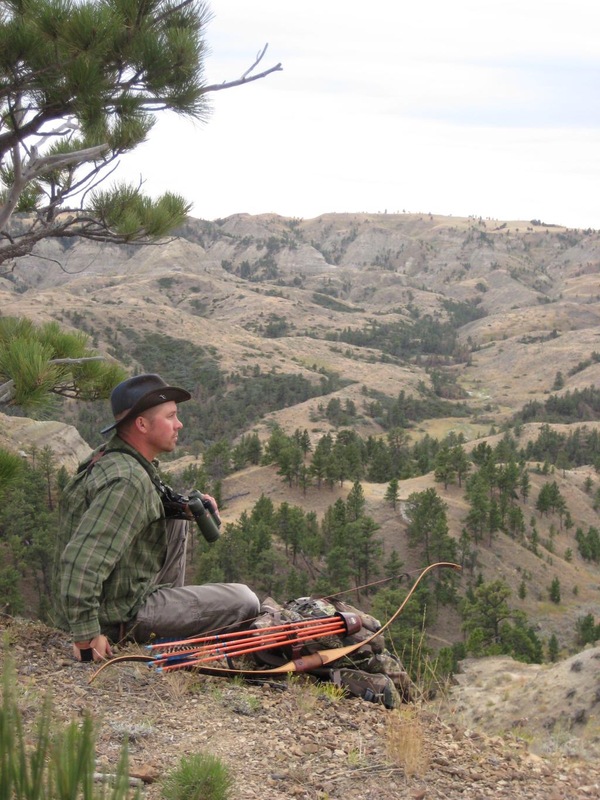 Yea, I didn’t see or even hear any elk today…but…I didn’t miss one with my bow either. And I wasn’t thirsty because my water was still on my back. And I was having no problem seeing the moonlit road in front of me on my way back to my pickup. 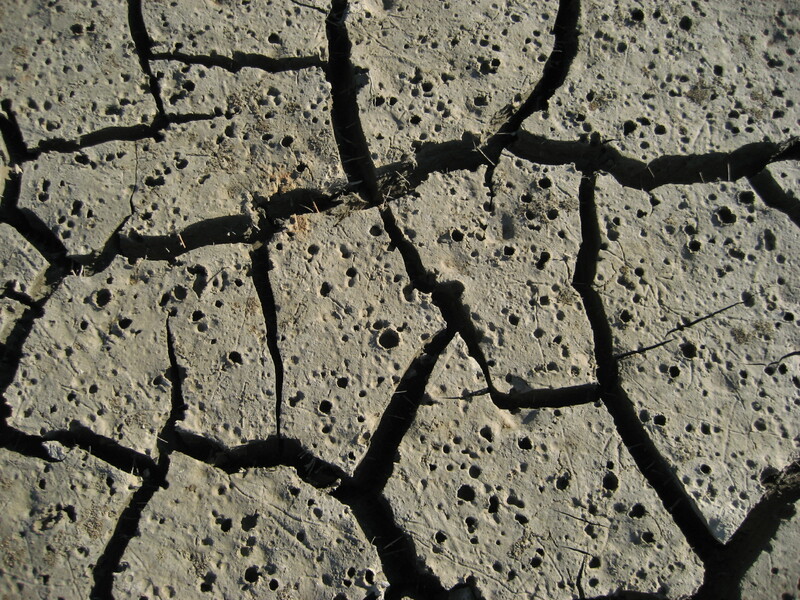 As I looked down, I could see four-wheeler tracks imprinted in the dirt. I remembered seeing a pickup parked alongside the road with an ATV trailer on my way in today. I bet their feet didn’t hurt and they were already back at their pickup. I was still several miles away from mine and the elevation increased the entire way. But then I thought of Fred Bear’s hat and the branches and whatnot in the hatband. I bet those guys on the four-wheelers didn’t hear the packs of coyotes I was hearing. Or the crickets. Or the owls. I bet over that buzz of the motor they didn’t hear anything. And with their headlights on I bet they coUldn’t see the amazing shadow the moon could cast. 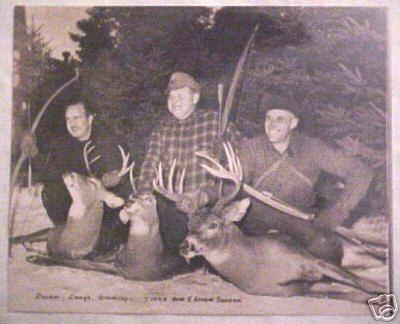 And so, I bet they didn’t contemplate the days hunt or life in general during their relatively short ride back. The last time I was on this road back to my pickup, I was walking with a buddy. He had just missed a huge herd bull. We had located, stalked, and then called the big bull away from his cows enough for my buddy to get a perfect opportunity with a close, broadside shot. I have missed bulls more times than I care to remember and countless times on game in general, so I sympathized with him. “Welcome to bowhunting” is about all I had to offer his anguish. 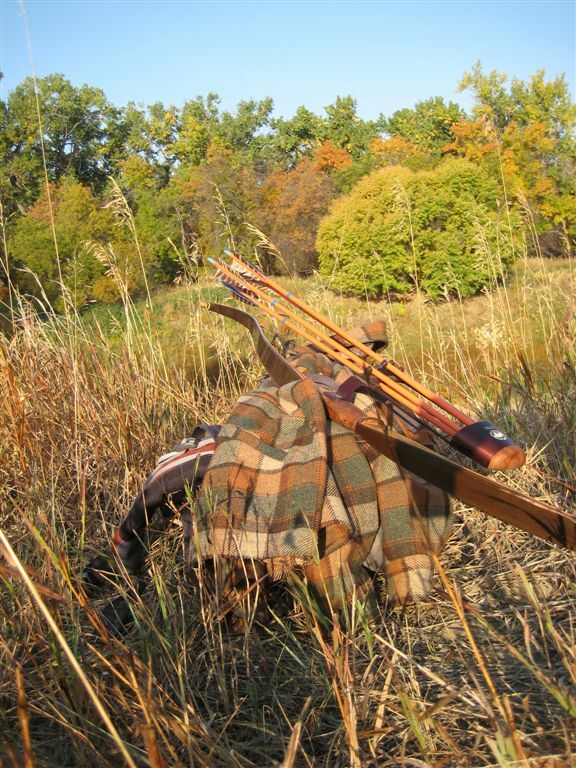 My buddy is a great shot too…in fact, he just “Robin Hooded” an arrow during our last shooting session. Last year he shot his first buck out of a stand we put up together on only his second evening of hunting. Bullseye. 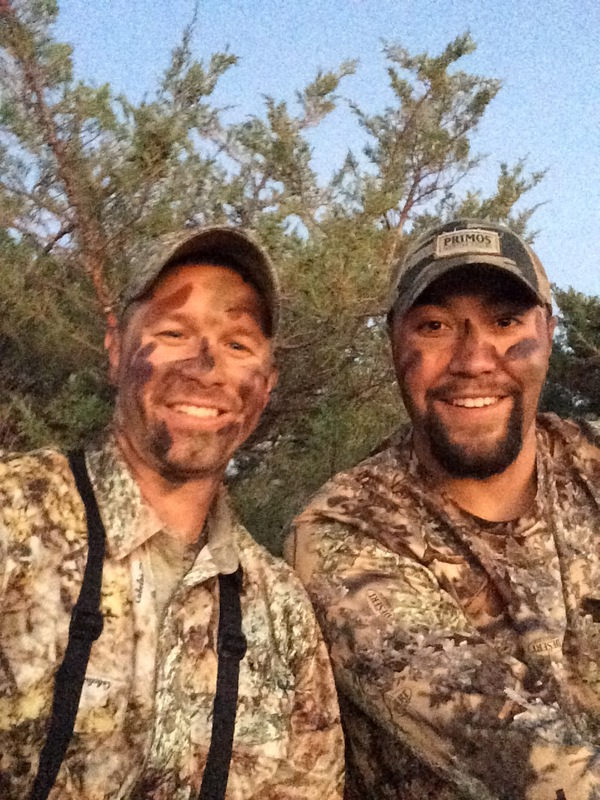 I found myself thankful to have shared that day’s hunt with such a good friend and we had a great conversation during the long walk back. 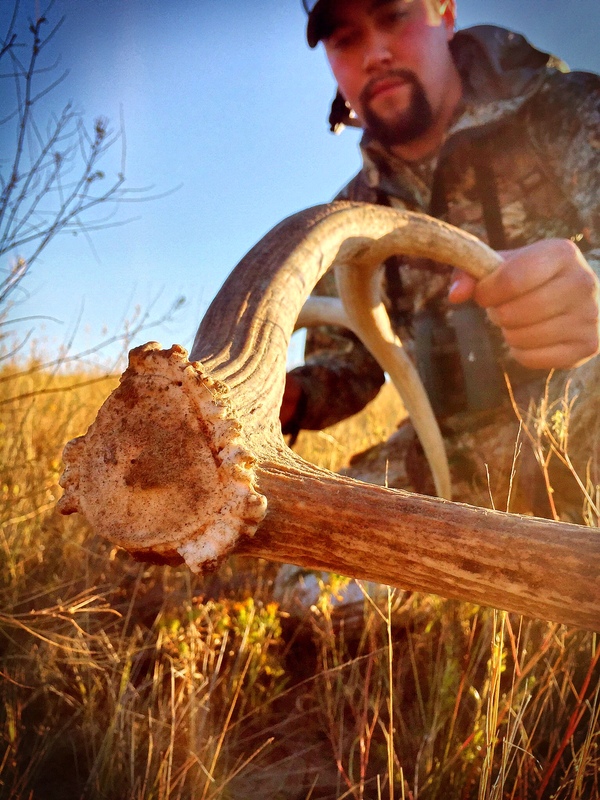 Bowhunting is a lot like life in general I suppose, and nature has other plans in many ways. Both of us just lost a true friend this week and it’s been tough. During tonight’s walk, I again thought about my friend and my wife and my kids and my many blessings…and, and, and, and. I thought about precious life and cherishing it’s moments. This is why I bowhunt. Thank you Lord for hanging such a wonderful moon and reminding me. Take time and look around you. It’s not about what’s at the end of the blood trail, it’s about what you experience along the way. Here are some photos I would like to share with you from some of my journeys. I have thousands, these are just a few. I can’t imagine the content we would have if Mr. Bear could have recorded, photographed, and shared his hunting experiences with us merely using something that fit in his shirt pocket. My cousin’s elk killed with a bow he made. 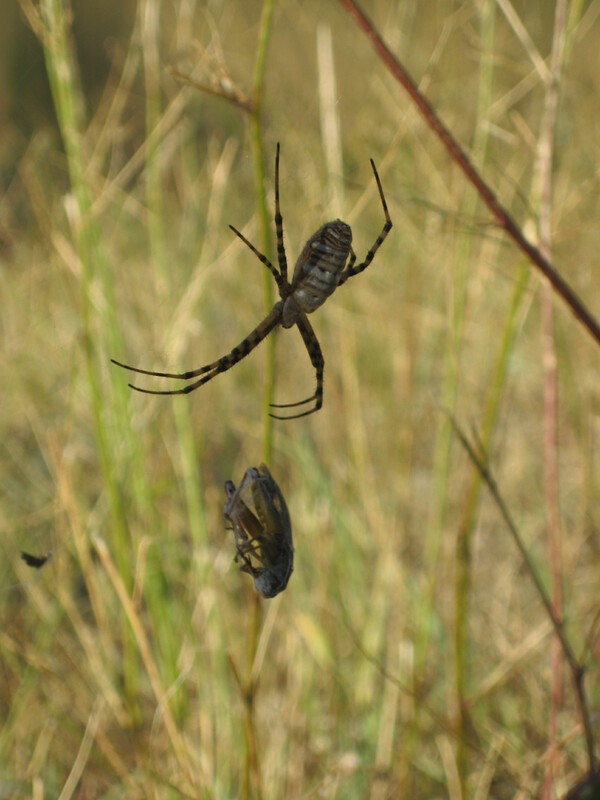 I can’t remember what kind of spider this was. His dinner was ready. I watched him for half an hour. 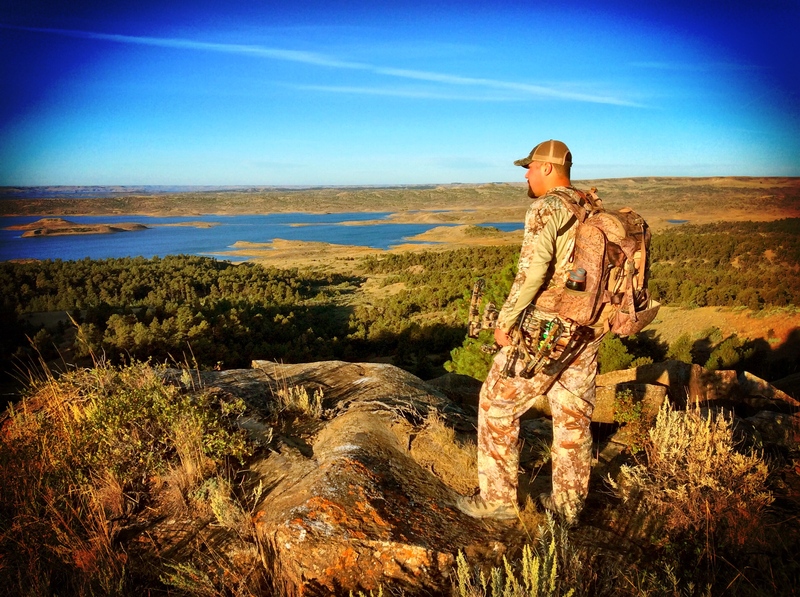 Elk hunt. A buffalo skull I found while hunting revealed in a washout after heavy rains. 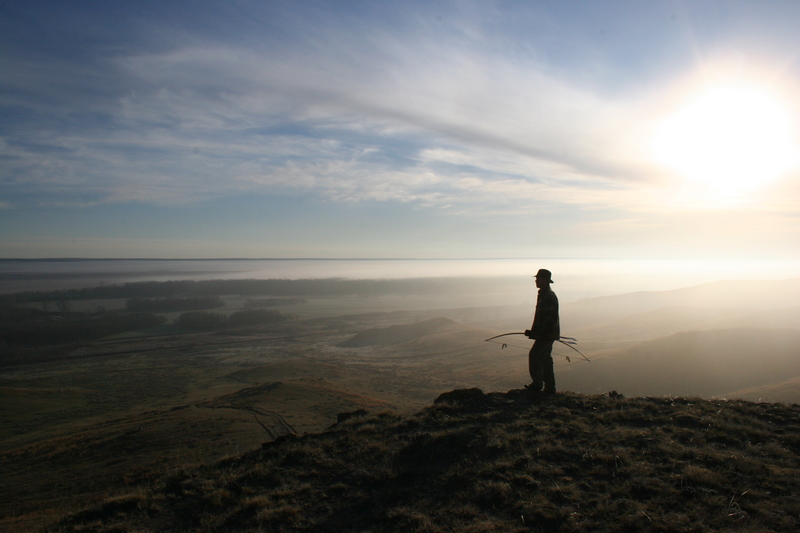 What was nature here like when it was King of the Plains? Hundreds…thousands of years ago…? Soil next to a lake after a hail storm added character to it. Take time to appreciate the view around you. I’m thankful for family and friends that have shared my memories. 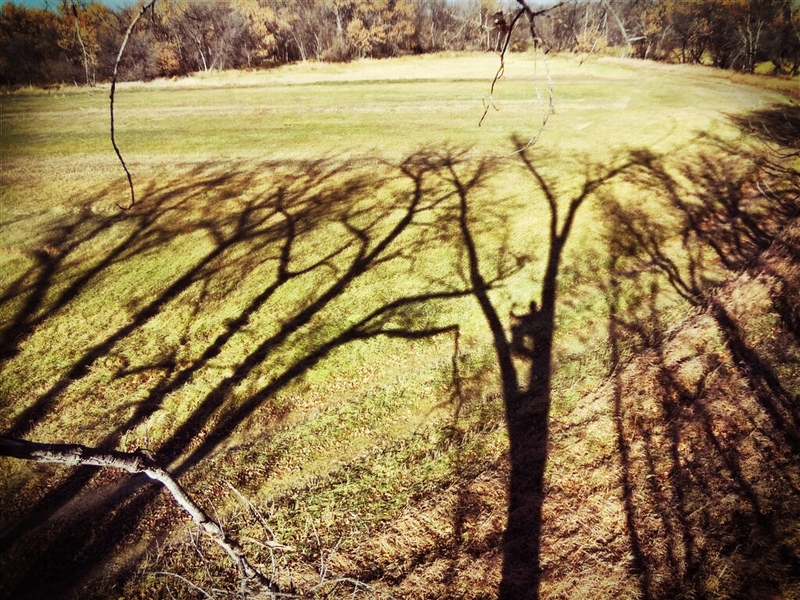 Bowhunting provides ample time to reflect and re-prioritize the important things in life. A few of the effects of this are humbleness and thankfulness. I am thankful for having had my friend Wayne in my life, even if too brief. He showed us what true courage really is and has set the bar rather high on how life should be lived. 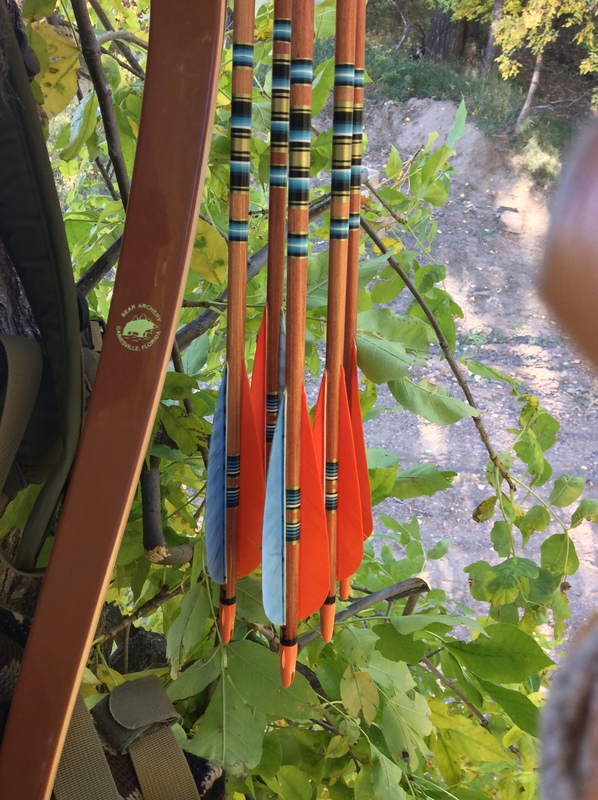 This entry was posted in Bear Archery, Luke Strommen, Traditional Archery, Traditional Archery Hunting, Traditional Bow Hunting and tagged bowhunting, Fred Bear, full moon, Luke Strommen, Moon, traditional bowhunting on October 2, 2015 by rosecityarchery.